There are 37 reviews of Lucky Number 6 for Men. This fragrance I've been a fan of for the past 11 years now.Not that I've ever worn with this all the time without a change of pace...but I really do like Lucky Number 6.But I've worn it daily the mass majority of the time.For a cheap fragrance it sports a scent reminiscent to it's bottle look. I get a base of black leather that's new or polished...it's identical to that petrol-like leather note in Fahrenheit by Christian Dior.Dark plum and oriental spice comes across and seasons this leather.There's a interesting combo of dry moss(green note) getting some citrusy edge from the neroli in this.A little sharp but also bracing and exotic to the nose.Last is the hint of sandalwood that peeks out of the plum and spice adding a little more to it's dark oriental flavor.Everything about this fragrance is black and red except of course the green/citrusy touch. It's a low projection fragrance but runs steady on my skin 6-8 hours.Runs about another 4 hours as a skin scent.It's comfortable for casual or work wear.It's a great scent for being inexpensive but I would call this mature minded. for the price,this isn't a bad deal if you are looking for a semi-generic refreshing fragrance for something like freshening up after a shower at the gym...its pleasant and refreshing..and a plus for these type of inexpensive fragrances is it doesn't smell overly synthetic to me..a nice fruity fresh plum/pineapple opening with little nuances of spice/greenery/woods..but alas, as most fragrances of this type, it only has about an hour or two of action on my skin..agree with others that this bears strong resemblances to Curve..i'll go out on a limb and say to me it can also fit into the general ballpark of Unforgivable, Ed Hardy, creed MI...not bad for a cheap all around workhorse...for myself, had one of those little 15ml bottles...I'm done, not getting any more, but that's just me.. Hats off to Lucky Brand for taking a chance on some pretty daring top notes. Not just the usual lemon zest here, but instead an odd sweet/savory accord with suggestions of coriander and chili peppers. 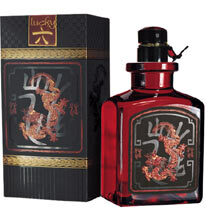 It has me thinking of take-out from the Thai restaurant around the corner, and for a few minutes I anticipate something more interesting than a bland men’s “sport” fragrance. The rest of Lucky Number 6 is nothing quite so terrible, but it’s not terribly exciting, either. As the quirky top notes dissipate, Lucky Number 6 sheds any hint of exoticism and settles into a pleasant, but undistinguished spicy fougère groove. I give it credit for not smelling overtly chemical, and for maintaining a well-judged balance between, woody, spicy, and abstract fruity notes at its core, but I can’t help feeling disappointed that it doesn’t live up to the promise of its clever, funky opening. Lucky Number 6 is a nice surprise. I got a bottle of it in a swap here, having never smelled it before, and I enjoy it enough that'll I'll probably seek out a backup at some point. Being that there's no picture here on basenotes, I have to assume those saying this smells like Fahrenheit or Grey Flannel are mistakenly filing reviews for a different scent here. This has nothing in common with Fahrenheit or Grey Flannel. It's a sweet, fruity crowd-pleaser type of scent. I also think there's some confusion about this one online. Sometimes it's listed as a Lucky Brand scent. Other times, it's listed as being by Liz Claiborne. This is an ultra-safe scent, and that's not a bad thing. Cheep & cheerful. It smells like plum and neroli over amber and spice. Maybe there's some sandalwood in there too. I give it a thumbs up without hesitation.